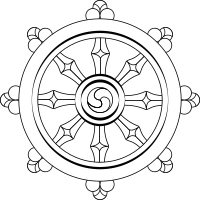 The following outline is provided as an overview of, and topical guide to, Buddhism. Describes the path out of suffering. 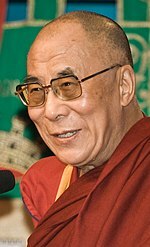 The 14th Dalai Lama, Tenzin Gyatso, a renowned Tibetan lama. ^ Williams (2000, pp. 6-7) writes: "As a matter of fact Buddhism in mainland India itself had all but ceased to exist by the thirteenth century CE, although by that time it had spread to Tibet, China, Japan, and Southeast Asia." (Originally 1958), "Chronology," p. xxix: "c. 1000-1200: Buddhism disappears as [an] organized religious force in India." See also, Robinson & Johnson (1970/1982), pp. 100-1, 108 Fig. 1; and, Harvey (1990/2007), pp. 139-40. ^ Gethin, Rupert. 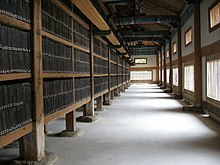 The Foundations of Buddhism, p1. Oxford University Press, 1998. ^ "The World Factbook: Sri Lanka". CIA World Factbook. Retrieved 2006-08-12. .